I’m not really sure how the idea hit me for this Haunted Portrait Costume, I think it was a combination of ideas and thoughts that came together. I knew I wanted something different, something that would stand out. But also I wanted something interesting, something that would move or pop-up. So I started to plan and think about what I could achieve. I started to think around some kind of arm puppet horror extension but then I moved into being the puppet myself using my head and a fake body. My ideas were wild and unlimited however I had to dismiss several ideas due to practicality of size and the time I had to make the outfit. As I scaled back my ideas I hit upon the idea of a frame to limit the size, a portrait frame just naturally followed as the next step. Because I was still hooked on the arm puppet idea I originally was going to have a fake arm so I could surprise people and grab them with the arm from the portrait. However something still seemed to lack from the overall idea. 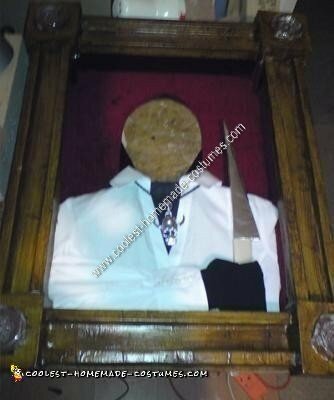 So after some further thinking I decided it would be more of a surprise to rig the portrait to drop down suddenly decapitating my head from the body in the portrait. I started by making a deep base for the frame to fit over my head and house the mechanics of the frame. The overall size I made big enough to cover my shoulders so that the overall effect would not be lost. The sides were a simple design of double layered cardboard with a hollow groove in-between, this allowed the bottom of the frame to slot inside the sides of the frame and move up and down. I then attached some wood to the mechanism about halfway up the frame, which would allow me to build on the body of the portrait later. Next I built the actual frame front. I made this too out of cardboard, pizza boxes for the corners, taped layered strips for the raised sides and the bottom of drinks bottles for the corner details, which I later spray painted gold. 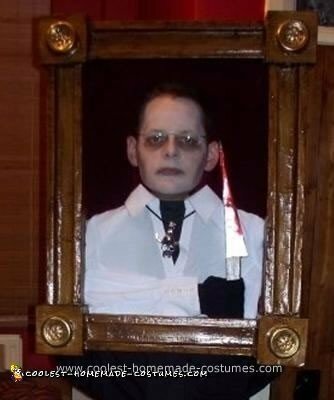 The frame front was cut into 2 pieces because the frame would need to separate when the body of the portrait decapitated from the head. Both the front and base of the frame were paper mache and once dried I varnished the frame to give a wood effect. 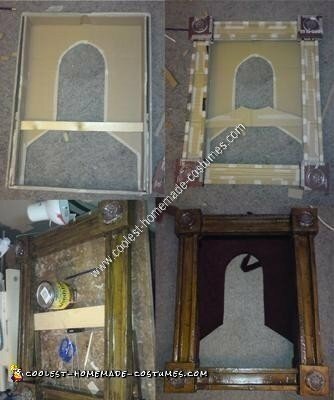 I also cut up an old velvet bath robe to line the base of the frame. Then I glued both the bottom parts of the frame together and both the top parts of the frame together. The bottom part of the frame was slotted into the top part of the frame and I started work on the portraits body. 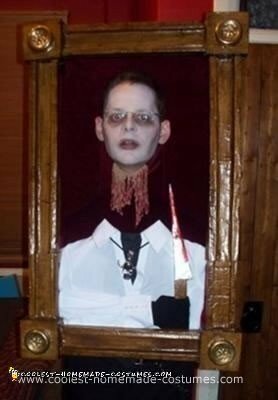 I used a glue gun and glued a shoulder shaped cut out piece of cardboard to the wood I fixed earlier to mechanism in the base of the frame and started to glue and dress the base of the frame with a cheap shirt, a glove and a Halloween necklace I picked up from the £1 shop. Additional details of the knife were made out of foil and cardboard, painted with Halloween blood and glued into the gloves hand. The torn neck was a last minute idea and great success as I really hadn’t figured out what I was going to do for that bit. I almost left it after attempting to do something with red liquorish but then hit on the idea of using skin coloured tights, glued into place and also painted with fake Halloween blood. Finally I painted my face and I dressed all in black to ensure the frame stood out. To drop the frame I simply pulled the frame quickly down when someone was close enough to scare. Hahahahahaha (evil laugh). Hey Wow man!! thats the most coolest awesomest costume I ever saw. Totally radical design dude! I have had a lot of costume ideas that are difficult to explain to people, but once completed, they are blown away with how a person could think of something like that. This is one of those incredibly creative ideas. Amazing execution (no pun intended)! My son just couldn’t figure out what to do for Halloween this year until he saw your pictures. Perfect for a teenage boy! It was more work than we expected, but the end result looked great. Thanks! Halloween costumes have got to be original! I must say it’s extremely original, and one of the best I’ve seen. Very awesome idea–especially the idea of having the frame drop and the decapitation. Awesome.